Here are the Hot Jobs in the New Bedford area from the NewBedfordGuide.com jobs database, as of May 6, 2018. Click the right arrow to browse the next job. Want your job listed here? Contact leo@newbedfordguide.com. supplemental oxygen products and supplies to home care patients within a prescribed and assigned geographical area. • To become familiar with all DOT and FDA regulations as they pertain to oxygen. • Assists, when necessary, the pulling of equipment and supplies from the warehouse as prescribed on patient/client delivery tickets. • Loads the equipment, oxygen systems, and related supplies on to a delivery vehicle. • Determines or obtains best daily route, then drives delivery vehicles on that route, to deliver durable medical equipment, oxygen, and supplies to home care patients/clients in a timely manner. • Provides patient/client orientation, instructing on the proper use of equipment, when applicable. • Works with patients/clients to solve a variety of problems, thereby acting as a company field representative. • Picks up rental equipment, as directed. • Returns and unloads returned rental equipment at the warehouse facility. • Completes delivery and pickup paperwork promptly and accurately, returning said paperwork to the appropriate facility personnel. • Assists in cleaning and disinfecting rental equipment. Assists in minor repair work. • Performs daily preventive maintenance, as required, on assigned vehicle. • Maintains a neat, clean personal appearance. • Promotes teamwork among co-workers that includes assisting fellow drivers, as needed. • Works Saturdays or Sundays on a predetermined, schedule. • Takes “on call” time on a predetermined, rotating basis, coinciding with the Saturday shift. • Performs warehouse and office maintenance tasks as required. • Demonstrates timeliness, courtesy, sincerity and patience with dealing with customers. • Markets the company in a positive and professional manner at all times. • Accepts other duties and activities as assigned. • In an 8 hour day the employee lifts/carries 80-120 lbs. frequently. • In an 8 hour day the employee stands/walks 2 hours. • In an 8 hour day the employee drives a car/truck 6 hours. Enos Home Oxygen & Medical Supply, Inc. is an equal opportunity employer. All employment decisions are made without regard to race, color, age, gender, gender identity or expression, sexual orientation, marital status, pregnancy, religion, citizenship, national origin/ancestry, physical/mental disabilities, military status or any other basis prohibited by law. Please review all application instructions before applying to Enos Home Medical. 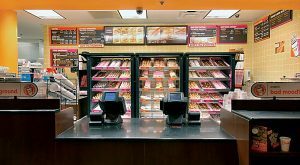 Dunkin’ Donuts is hiring for multiple positions in New Bedford and Fairhaven. The job pays $11 an hour plus tips! Paid vacation & health insurance. Call: 508-995-0513 and they will match you up to a store nearest you to set up an interview. Whitney Academy Inc., a unique, Joint Commission accredited, residential treatment center, serving adolescent boys with cognitive delays, psychiatric diagnoses and behavior problems. We are currently accepting applications for our intensive treatment programs located in Dighton, Assonet and Freetown, Massachusetts. Candidates must be mature, possess a minimum of a High School Diploma or equivalent and a valid drivers license. RMV, CORI and DSS checks are required. Salary up to $28,600; commensurate with degree and experience in a related field. Performs various types of skilled repairs on all types of diesel equipment in use by the City to determine repair costs, maintenance work in the area of electrical, fuel, ejectors, and ignition problems. Disassembles, overhauls, removes and replaces all types of engines. Assembles and disassembles transmissions. Knowledge of various hydraulic systems, clutch replacements and components. Performs track replacements and various components, brake jobs, and other miscellaneous maintenance tasks requested. Works on emergency vehicles. Performs all preventative maintenance and any related work. Ability to write detailed reports and estimate repair costs. Graduation from a high school or GED equivalent preferred. Must have at least three years of full-time paid experience in the field of repairing diesel equipment, knowledge of job hazards, handling of equipment, special tools and test equipment. Possession of a valid Massachusetts driver’s license. Possession of Class B CDL or the ability to obtain one within six months of hire. Operates a motor vehicle on a regular basis. Mandatory CORI (Criminal Offender Record Investigation) background check per City Council Ordinance effective May 14, 2013. For application/complete job description, please visit www.newbedford-ma.gov or contact the Personnel Dept., 133 William St., Room 212, 508-979-1444. Applications will be accepted until a suitable candidate is found. EEO New Bedford has a residency requirement. Provides administrative support to the Department of Parks Recreation & Beaches; manages day-to-day duties in an efficient and timely manner; attends meetings; processes accounts receivables, accounts payables and payroll for Department; performs technical and administrative duties as requested by supervisor. Performs office administrative duties dealing with incoming and outgoing correspondence, mailings, phone calls, forms, requests, bills, permits and fees; ensures all correspondence is sent or received through follow-up procedures; applies corrective office policies to ensure maximum efficiency. Manages the special event process for the department. This includes collecting fees if applicable, estimating fees, scheduling events with organizers and monitoring events. Works with other City departments to make sure events are approved and in compliance with the requirements of this department and Park Board. Camp Frederick Douglass at the New Beford YMCA is looking for motivated individuals for seasonal employment in the following areas!Must be 17+ to apply and must have experience for specialist positions.Camp CounselorsSTEM SpecialistQualifications: Must have experience in the specialty that you are applying for.How to Apply: ContactRoss GraceChildcare Directoratrgrace2@ymcasouthcoast.org. Enforces all provisions of 780 CMR, 521 CMR (Architectural Access Board) and any other State statutes, rules and regulations, and ordinances and bylaws, which empower the building official. Explains, interprets and provides guidance regarding all applicable codes within area of responsibility to architects, engineers, contractors, developers and other interested parties. Works with departments to review residential properties that pose a health safety or risk to the community and are abandoned. Undertakes activities associated with code, safety and health review of violations specifically on abandoned properties targeted by the Housing Task Force. Conducts an initial visual inspection of abandoned residential properties to identify the occupancy status and the nature and extent of health, safety or code violations. At least five years of experience in the supervision of building construction or design; or a four-year degree in a field related to building construction or design; or an Associate’s degree in a field related to building construction or design; or any combination of education and experience, which would confer equivalent knowledge and ability as determined by the BBRS. In addition, such persons shall have had general knowledge of the accepted requirements for building construction, fire prevention, light, ventilation and safe egress; as well as a general essential for safety, comfort and convenience of the occupants of a building or structure. Possession of a valid Massachusetts driver’s license and good driving record. Must have a Criminal Offender Record Information (CORI) check, mandatory by MGL Chapter 6 Sec. 172C. The Information & Eligibility Specialist will facilitate information sessions to disseminate accurate information regarding the requirements to apply for Workforce Innovation and Opportunity Act (WIOA) funded services and other programs with eligibility screening processes. The Information & Eligibility Specialist will collect required documentation, verify compliance with program requirements, and complete and accurately data enter the information. ESSENTIAL DUTIES AND FUNCTIONS include the following. Other duties may be assigned. 1. Facilitate Information Sessions describing the WIOA and other program certification processes. 2. Assist applicants in compiling all required documentation. 3. Meet with customers to complete the program applications and submit to the appropriate stafffor review & approval. 4. Make corrections to the file as needed and inform customers of their next steps once the certification has been approved. 5. Timely data enter information. 6. Follow up with customers to collect documentation. 7. Accurately calculate income eligibility, as required. 8. Enroll customers into workshops or services requiring WIOA certification. 9. Educate customers to ensure they understand the full range of services available through the Career Center. Responsible for own work and not normally required to direct or supervise other personnel, but may occasionally instruct or show another employee how to perform the work. Bachelor’s degree or equivalent from a four-year college; a minimum of one year of related experience in workforce development or human resources; or equivalent combination of education and experience. The ability to understand more advanced computer skills and be proficient in the advanced knowledge of software such as Microsoft Word, Excel, PowerPoint, Access. Under the supervision of the Clinical Team Leader with input from the Operations Team Leader, perform a variety of support responsibilities including direct patient care, medical records processing, equipment, supply and facilities maintenance, and equipment management. Perform other related site-specific duties as required or assigned.Responsible for own work.Education equal to completion of four years of high school or equivalent required. Previous experience in customer service and ability to learn internal computer systems in order to carry out own position responsibilities required. Experience working in a medical or rehabilitation environment preferred. Minimum three months experience required. CPR cerification required. Under general supervision of the Team Leader, Rehab Operations, perform a variety of office support, coordination of various patient care processes and other related duties in accordance with established Rehabilitation Services department policies and procedures.Not Applicable.Equal to completion of four years of high school plus additional specialized courses or training, secretarial school, diploma, or medical office certification. Duties require knowledge of medical terminology. Proficient keyboarding skills are essential. Must possess strong reasoning and critical thinking skills. Proficient in use of software applications such as e-mail, Word, Excel, EHR. Exceptional customer service skills are required. Over three years of related medical office work experience is required. Associates degree preferred. New Directions Southcoast Inc. is announcing that starting Tuesday, February 20, 2018 summer job applications will be available to New Bedford youth age 14-21 from 2:00PM-4:00PM at the New Directions Youth Annex, 5 Dover St., 2nd floor, downtown New Bedford. Summer applications will be available in hard copy only at the Youth Annex, Monday-Friday from 2:00PM-4:00PM from February 20-March 9. Youth must be at least age 14 to pick up an application. Applications will not be distributed after March 9, 2018. All youth are required to be present to receive an application, attend scheduled appointments, return completed application and supportive documents and meet eligibility requirements to be considered for this youth program. Recruitment for the “Winter Jobs” program for out-of-school youth is ongoing and youth age 17-24 who are not attending High School may pick up an application at the Youth Annex Monday-Friday from 10:00AM-2:00PM. The Winter Jobs program offers free pre-employment training and a four week paid work experience with potential for permanent employment. New Directions is the Career Center operator for the Greater New Bedford Workforce Investment Board and the administrator of Title 1 Workforce Innovation and Opportunity Act for adults and Youth Works summer jobs programs for youth. New Directions provides employment and training services to eligible youth ages 14-24 living in the Greater New Bedford area. State funding for summer jobs is funded by YouthWorks, through the Commonwealth of Massachusetts, Executive Office of Labor and Workforce Development. The YouthWorks program is administered by the Commonwealth Corporation. For more information, please contact the New Directions Youth Annex, (508) 979-1700 or on Facebook at Greater New Bedford Youth Annex (New Directions). Are you passionate about hair? So are we!!! We are searching for the perfect candidate to join our growing TRIBE. We provide full time front desk support to build your business with us! We are committed to life long learning and all educational events are provided free of charge. We have guests waiting to see you! Of course, must be licensed, but experience is not necessary. for project development and or refinement. * Project administration and coordination. * Performs on-site inspections and travels throughout the City. * Attends meetings required for project development. * Processes payments for approved contracted work and procurement responsibilities. * Other duties as assigned by the Director of Planning, Housing and Community Development. * Attend public meetings to provide project descriptions and explain project designs. Graduation from an accredited college or university focusing on construction, accounting, public administration, legal or closely related field. Contractor certification/license preferred. Mandatory CORI (Criminal Offender Record Investigation) background check per City Council Ordinance effective May 14, 2013. Conducts inspections, investigations and communication/outreach activities throughout the City to ensure compliance with all City, State and Federal requirements. Assists with implementation of meter program, backflow prevention device testing and sewer deduct meter inspection program. Ensures customer compliance with City Ordinances, as well as any State and/or Federal regulations. Issues Violation Notices to achieve compliance with regulations. Initiates litigation against parties who fail to comply with departmental notices. Responsible for maintaining organized documentation and record keeping of Water Division programs. Assists with data management of Water Division, including but not limited to, digitization of existing records, distribution system maintenance and repair records, and the City’s data management program. Graduation from high school or GED equivalent. Must possess excellent verbal and written communication skills. Possession of a Backflow Prevention Device Testing/Inspection license and proficiency in digital data management preferred. Possession of a valid Massachusetts driver’s license and good driving record. Provides administrative support to the respective Department; manages day-to-day clerical duties in an efficient and timely matter; attends meetings, prepares and transcribes meeting minutes; processes accounts receivables, accounts payables, and payroll for Department; performs technical and administrative duties as requested from supervisor. Receive and review reports pertaining to specific Department matters; analyze and provide documentation of the filing of reports; follow-up with appropriate employees regarding information contained in reports. Process, manage, and review financial items for Department including accounts payable, accounts receivable, grant budgets, purchase orders, contracts, bids, payroll, and monthly reconciliations. High school diploma or GED equivalent. Two years of administrative, professional, or relevant experience. Any equivalent combination of education and experience. Must have a Criminal Offender Record Information (CORI) check, mandatory by MGL Chapter 6 Sec 172C. Immediate opening for Guest Services Agent. This is a part to part-time position. The ideal candidate must be able to work 2nd shift (3 pm to 11 pm) and 3rd shift (11 pm to 7 am) and have the ability to work independently, as well as part of a team. Must be computer literate, and be available weekends and holidays. Excellent Customer Service is a must. The comfort and happiness of our guests’ is our main concern, and all of our Guest Services Agents must welcome and acknowledge all guests according to company standards, anticipate and address guests’ service needs, and thank guests with genuine appreciation. We promote a drug and alcohol-free work environment. If you would like to be considered for this position please email us your interest and contact information or a current resume. You can also visit 110 Middle St at the Front Desk and fill out an application in person. Manage and supervise planning operations to achieve goals within available resources; plan and organize workloads and staff assignments; train, motivate and evaluate assigned staff; review progress and direct changes as needed. Provide professional planning and land use advice to supervisors and other officials; make private and public presentations to supervisors, boards, commissions, civic groups and the public. Review all building permits and Certificates of Occupancy; draft and review updates and revisions to the Zoning Code of Ordinances; work with developers and applicants to ensure efficient permitting process and quality process. Master’s Degree in planning or a closely related discipline. At least five years of experience in municipal planning or a closely related field. Any equivalent combination of education and experience. Must have a Criminal Offender Record Information (CORI) check, mandatory by MGL Chapter 6 Sec 172C. Maintains and performs minor repairs of all City vehicles. Road calls for flat tires, dead batteries and lockouts. Pumps gas and diesel fuel into cars, trucks and other municipal vehicles; records fuel and other parts and supplies used, picks up parts and supplies; performs minor repairs, changes light bulbs, basic fluid checks, etc. ; cleans and washes vehicles, maintains cleanliness of work area. Must have valid Massachusetts driver’s license and good driving record. Operates a motor vehicle on a regular basis. Mandatory CORI (Criminal Offender Record Investigation) background check per City Council Ordinance effective May 14, 2013. Applies basic accounting principles in maintaining financial accounts and records; may be required to prepare payroll and maintain personnel records; makes general ledger entries; accounts for receipt and disbursement of cash transactions and cash accounts; reconciles cash books; operates adding machines and computers; answers telephones; operates simple calculators in connection with this work. Performs clerical work of ordinary difficulty. Graduation from a high school or GED equivalent with specialized course work in general office practices such as typing, accounting, data processing, and two years of increasingly responsible related experience; or any equivalent combination of education and experience. Mandatory CORI (Criminal Offender Record Investigation) background check per City Council Ordinance effective May 14, 2013. Responds to given locations with lights and siren, driving in a defensive manner, obeying the rules of the road. Working alongside a Paramedic, stabilizes patients at scene, i.e. CPR, airway management, control bleeding, assists in starting IV, splints body as needed using proper equipment to load patient into ambulance. Prepares patient care reports contiguous with incidents to ensure continuity of care for the EMS Office, billing records and physician information. Ensures that equipment is in proper places and in good working order, cleans equipment and patient care compartment in order to have the ambulance ready for the next response. Replaces stock used in the course of patient care as required. Contacts the Dispatch Center in order to inform them of status relative to response, arrival, availability, deployment of additional resources for any other reason necessary for operation. Minor vehicle maintenance, which includes washing; checking oil, water, fuel; washing floors and cleaning windows. Attends re-certification classes in order to maintain certification. Applicants must possess current certification as an Emergency Medical Technician (Ambulance) by the Massachusetts Department of Public Health, and current certification as a Healthcare Provider by the American Heart Association (M.G.L., Chapter 111c, sections 3 and 6). Must have a valid Massachusetts driver’s license and good driving record. This position is subject to re-certification by the State Office of Emergency Medical Service. Enforces parking regulations and restrictions. Receives daily assignments, which determine assigned area of responsibilities. Obtains information from the supervisor, or designee, requiring special attention. Patrols particular assigned areas at the supervisor’s discretion. Check for any and all parking violations, including, but not limited to: expired meters, parking abusers, expired stickers/registration plates, “No Parking” areas, loading zones, time zones, fire hydrants, driveways, handicap parking and handicap ramps. High school graduate or GED equivalent. Ability to read and write English. Ability to reference codes for specific violations. Possession of valid Massachusetts driver’s license with a good driving record. Operates a motor vehicle on a regular basis. Mandatory CORI (Criminal Offender Record Investigation) background check per City Council Ordinance effective May 14, 2013. Performs a variety of semi-skilled and skilled technical and maintenance work in the operation, maintenance and repair of treatment facilities and systems. Adjusts equipment, as indicated, to regulate the flow of water and control the amount of treatment chemicals added; must assist with maintenance programs throughout the treatment plant, watershed and distribution system. Accurately records plant data and makes associated computations as necessary, as well as maintains operation logs; maintains optimum process control via sampling, laboratory testing, and machinery and equipment inspections and adjustments. Adheres to specific weekly schedule of responsibilities including chemical and preventative maintenance; assume responsibility of handling chemicals in a safe and efficient manner. Exhibits good attitude expected of employees in a health-related field; assumes responsibility for maintaining the plant in a clean and orderly fashion. Must assume responsibility for plant operations when on duty. Graduation from high school or GED equivalent, supplemented by four years’ experience as an attendant of a water/wastewater facility required. Possession of a Grade III Drinking Water Operator license. Possession of a valid Massachusetts driver’s license with good driving record. Must have a telephone and own transportation. This employee is subject to twenty-four hour call. * Directs and administers all activities of the Facilities and Fleet Management Department. * Oversees maintenance and capital needs of City buildings and fleet. * Delegates various responsibilities to capable and competent subordinates that will ensure a positive outcome. * Manages the budget using responsible and sound fiscal practices. within the limits of the budget. * Monitors all leases of City owned property, unless under the custody and control of another department. Ensures that all lease conditions are being met. * Allocates resources to satisfy the maintenance and capital needs of approximately 90 City buildings. * Investigates advanced methods and technologies of accomplishing tasks that will result in greater efficiency. Technical Degree in engineering, building trades, public administration, facility management, or a related field. Mandatory CORI (Criminal Offender Record Investigation) background check per City Council Ordinance effective May 14, 2013. Taps water mains 4” to 48” in size with a small taping machine from ¾” to 2”; repairs hydrants, gate valves. Performs other work in connection with the maintenance, construction, and repairs of the distribution, collection (and Highway System.) Installs water meters, operates gate valves, and service shutoffs. Capable of reading service cards, gate and hydrant location books and plans. Performs semi-skilled manual work in the construction, operation and maintenance of distribution and collection systems, including work on reservoirs treatment plants, pump stations and water gates. Cuts, lays and caulks water pipes using machine or hand tools forcing sealing compound into joints to make them watertight; pumps water from trenches; digs, braces and backfills excavations for the purpose of locating pipe leaks or preparing areas for laying pipes. Replaces worn and broken parts in distribution and collection systems. Operates motor equipment. * Education and Experience: Graduation from a high school or GED equivalent preferred. * Requires one year of prior experience. Must possess a valid Massachusetts driver’s license with a good driving record. Mandatory CORI (Criminal Offender Record Investigation) background check per City Council Ordinance effective May 14, 2013. Subject to call seven days a week/twenty four hours a day for emergency work. This position is deemed essential personnel and must report for duty during emergency situations. Performs semi-skilled manual work using taping machines; various digging devices. * The physical demands described below are representative of those that must be met by an employee to successfully perform the essential functions of this job. * Duties require frequent and extended periods of outside work, subject to all weather conditions and extremes; walking, standing, climbing, and frequent periods requiring sustained uncomfortable physical positions; regular and sustained periods of strenuous physical exertion, requiring the ability to lift, carry and position heavy objects utilizing proper body mechanics and techniques. * Operation of equipment that causes loud noise levels and high vibrations; may require the exercise of caution when operating equipment or handling chemicals or other toxic materials; utilization of proper sanitary precautions when handling trash, garbage and other potential hazards. Works outdoors in all types of situations and weather conditions. Works with water and sewage. Have a job to add to the Hot Jobs List? Contact leo@newbedfordguide.com.